Tomorrow is our last full day of vacation! As usual, time has just flown by. We have been having a great time, but like any mother on vacation, I feel like I am going to need a vacation to recover from this vacation! Last week as I was preparing for our beach trip, I spent a little time on Pinterest looking for some new ideas of things to bring to the beach for the kids to play with during our long days on the beach. I was a little disappointed that every article said basically the same things: buckets and shovels with a reminder to take plenty of juice so the kids stay hydrated. Duh! We take long beach trips since houses on the coast rent for a week at a time during the summer season. We usually spend all day on the beach, so we need lots of things for the kids to do. The beach in itself is its own entertainment. You can jump in the waves, hunt for shells and sharks teeth (which have been in abundance in front of our house), dig holes, and build sandcastles. However, with a 1-year old, 2-year old, 4-year old, and 2 11-year olds, you need to have a wide variety of entertainment options available to keep whining and complaining to a minimum. 1. A five-gallon bucket. 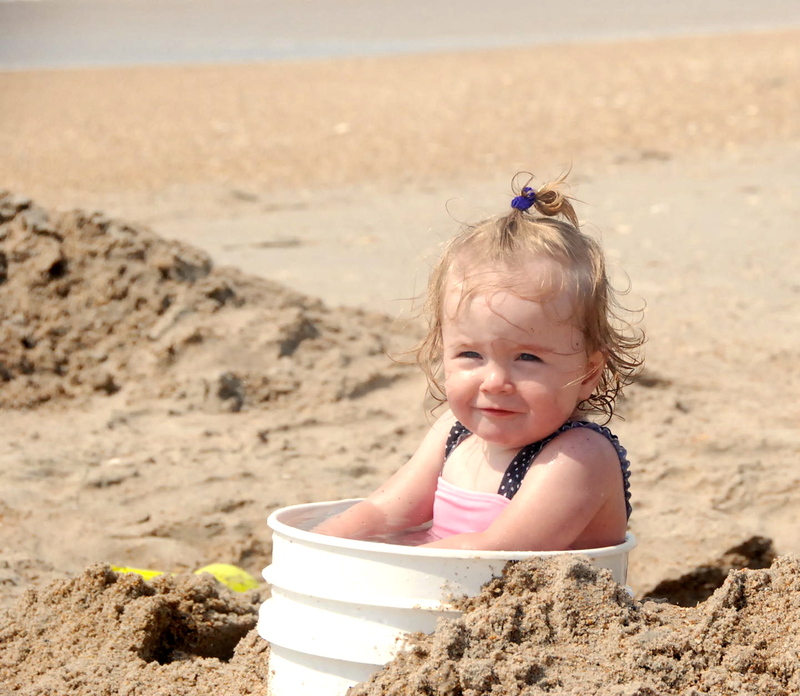 Sure, it is nice to have some smaller buckets for sand castles, but the bigger buckets are like little swimming pools for children. You can dig them into piles of sand to make them secure, fill them with water, and the kids have a place to lounge when they get hot or to wash off their hands if they need to. We actually brought 2 this time! 2. Different sizes of shovels. 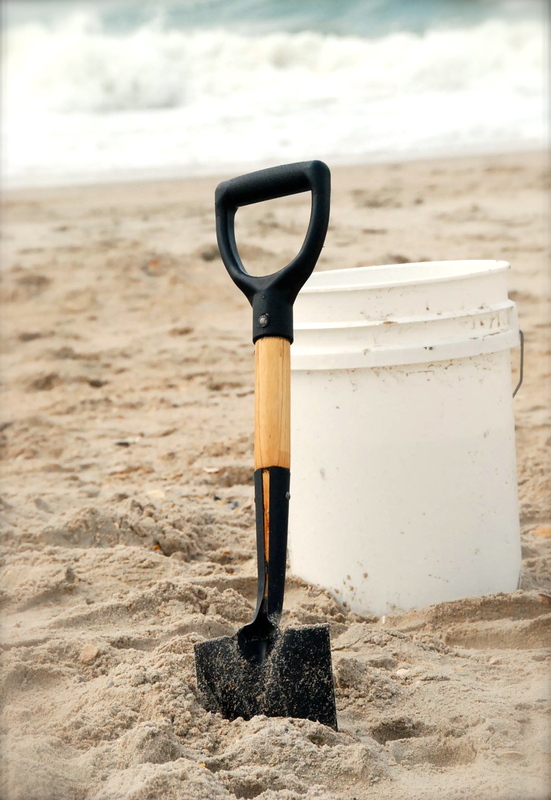 This is really important for digging huge holes and tunnels in the sand. This year, Jason even brought our huge garden shovel, and it has been a lifesaver! If all you have are the little plastic shovels, you won’t be able to do too much digging, and the bigger the hole the better! The kids spend hours playing in these holes, and you can actually SIT at the edge of the hole. 3. A tarp or some sort of plastic sheeting. I know this sounds crazy, but with this simple thing you can make an oceanfront pool! Dig a hole, line it with the tarp, and fill it up with water! If you have very small kids and don’t want them right at the water’s edge, this is great for them to have to play in! 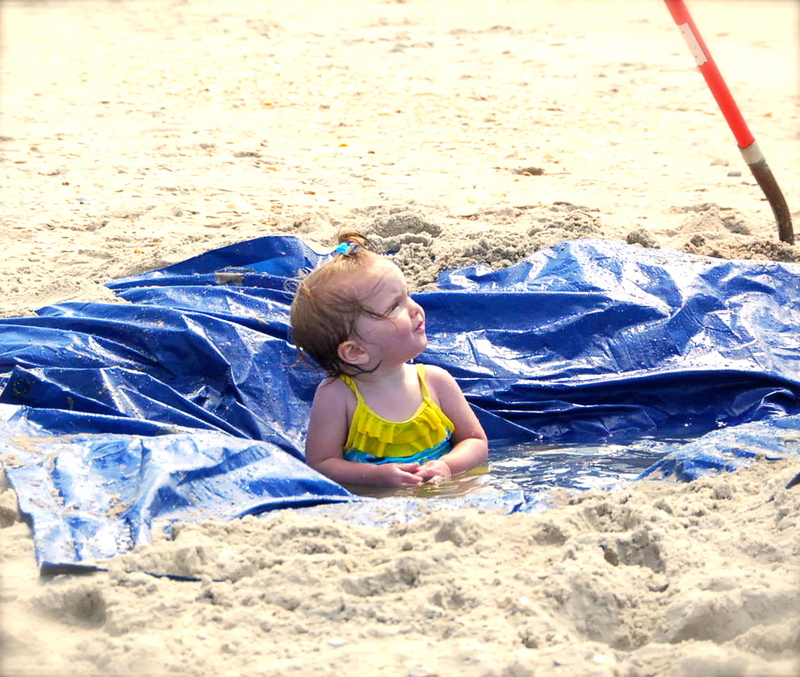 If you wanted to get really fancy, you could bring a little kiddie pool and take it on the beach. 4. Little fishing poles. 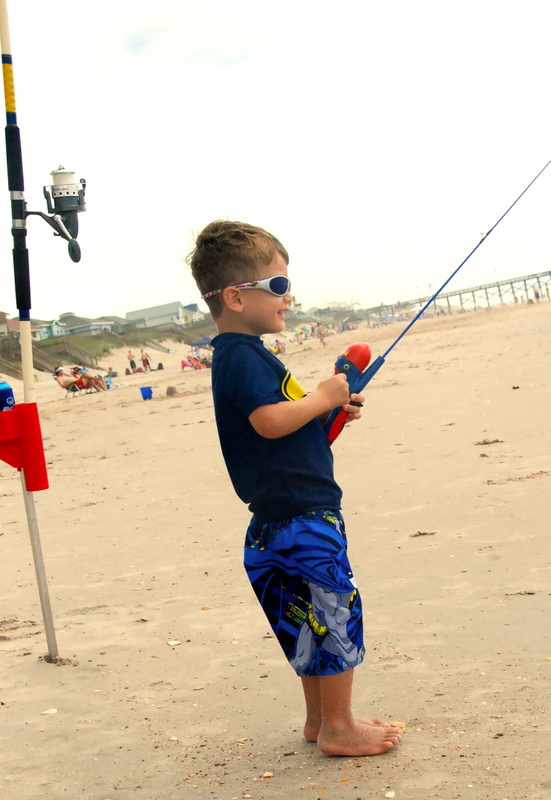 You can buy these for just a few dollars and the kids love “fishing” in the surf with them. Of course, you don’t really put a hook on the line! 5. Toy dump trucks, tractors, and bulldozers. I didn’t get a pic of this, but it’s fun to move the sand around on the beach with these. I know it will take up a little extra space in the car to drag all of these things to the beach, but if you’re getting a house for a week like us, it is totally worth it!